Thousands of companies are checking out of the “Hotel California” – and leaving – having split the Left Coast for greener pastures in the East. Texas, Florida, Georgia and North Carolina are among the prime beneficiaries as 9,000 businesses have fled California’s “hostile” business environment, according to a study by Joseph Vranich, a site selection consultant and president of Irvine, California-based Spectrum Location Solutions. “I even wonder if some kind of ‘business migration history’ has been made,” Vranich said. The study found that many of the 9,000 businesses relocated completely while others kept their headquarters in California but targeted out-of-state locations for expansion. Austin, Texas was the top city benefiting from the disinvestment trend from California. 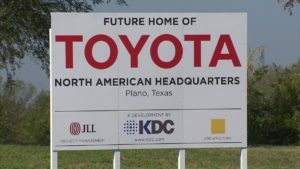 Other notable municipalities included Phoenix, Colorado Spring, Salt Lake City and Cary, N.C.
Toyota bolted Torrance, California and is consolidating its North American headquarters in Plano, Texas, where it will employ 4,000 workers. After escaping from high-priced San Francisco, Charles Schwab Corp. settled in Austin, Texas and has added almost 1,000 jobs. While Texas was the top destination of companies checking out of California, Virginia, Georgia, Florida and North Carolina have also benefited greatly. The study found Los Angeles led the top five California counties with the highest number of disinvestment events, followed by Orange, Santa Clara, San Francisco and San Diego.